Last week, we hiked up the back side of Mount Mesnard and were treated to a brilliant view of Marquette and Lake Superior. 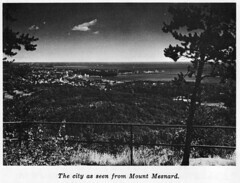 The view remains almost identical (compare with new photo) to this historic photograph (“The city as seen from Mount Mesnard”), as it appeared in an old pamphlet on the City of Marquette. The overlook functioned as a private tourist-park at that time, complete with a gift shop (formerly located adjacent to this overlook area) and viewing telescopes. The new trail starts down along the Carp River, on the back side, and includes views of nearby Marquette Mountain ski hill — the ski hill had been making snow, but the day was very warm, so the air in the Carp River valley was quite hazy.